Why is Making Art from Natural Materials Grounding? Nature is evocative, intoxicating, invigorating, fascinating. Experiencing the varied textures, scents, colors, and sounds of natural materials helps us to slow down our bodies, minds, and breathing. We zone into the current moment. We leave behind the assaults of a busy mind, and are “grounded” to the earth. How Do I Use Art from Nature as a Grounding Tool in a Purposeful Way? There are probably hundreds of ways to do this, so please let us know what works for you in the comments! I’d like to share the way I like to do it, and what works for many of my art therapy clients too. 1. Take a nature walk. Even if you live in the city- there are small and large green spaces lurking…look closely. 2. Pick up items that catch your eye, even if you aren’t sure why they attracted you. Even if you initially judge them as ugly, let them “choose you” instead of you choosing them. Need ideas of what to choose? 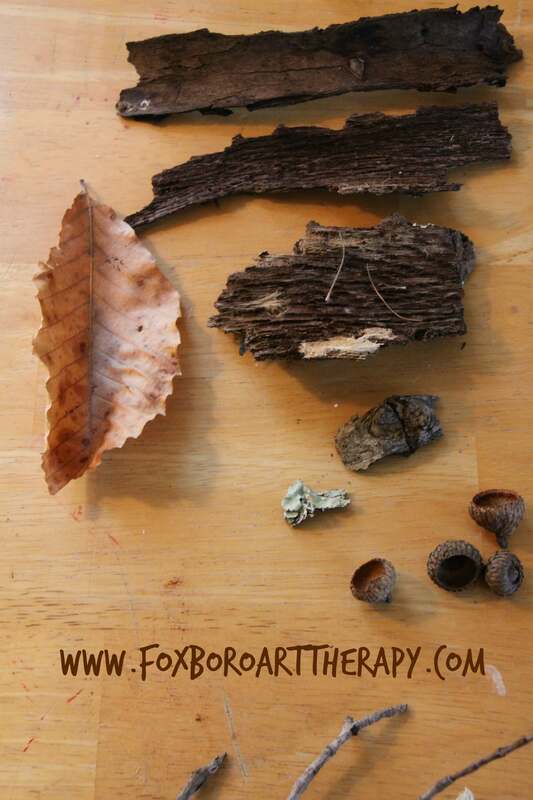 Pick up: smooth stones, sticks, beautiful or large leaves, seeds, pods, flower petals, shells, acorns, pinecones, or anything else that strikes your fancy. There really isn’t a right or wrong with this. 3. Take your time. Try to notice as much detail as you can through your five senses. This, as you may know, is a grounding tool called mindfulness. It’s a great tool against anxiety. 4. Close your eyes and create the intention of letting go of stress and anxiety while making art. Sit with this idea for a bit and make it as strong as you can. Then open your eyes and begin working with whatever catches your eye. You may also want to follow one of the suggested projects for inspiration. There really isn’t a right or a wrong in making this kind of art.The purpose is to experience, experiment, and create. You will do that just right, I promise. Enjoy the process, and trust the image that wants to emerge. 1. Create a Grounding Stone – Watch this amazing tutorial from mandala stone master, MagaMerlina, I promise she will inspire. 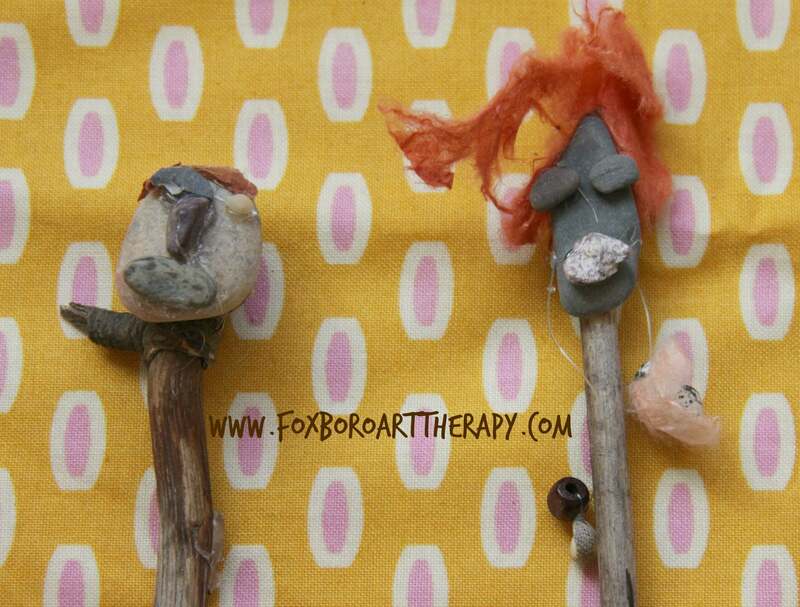 I created these funny little people just by using sticks, stones, some paper, my wild imagination, and a glue gun. What could you create with those materials? This piece with the “bells” is by my lovely friend, Emily Pavidis, visualization facilitator for the Mindful Art workshop we are co-facilitating on May 2nd. See below for more details if you are interested in making this kind of art with us. 3. Create a Natural Installation – Get outside, let nature catch your eye and “play” with the elements at hand. 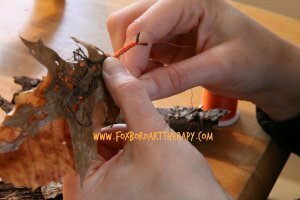 Create a teepee, or make a mandala from leaves and flower petals. Let your imagination lead the way. Artist Andy Goldsworthy does some of the most amazing natural installations, which he photographs and then allows to be taken back by the elements. 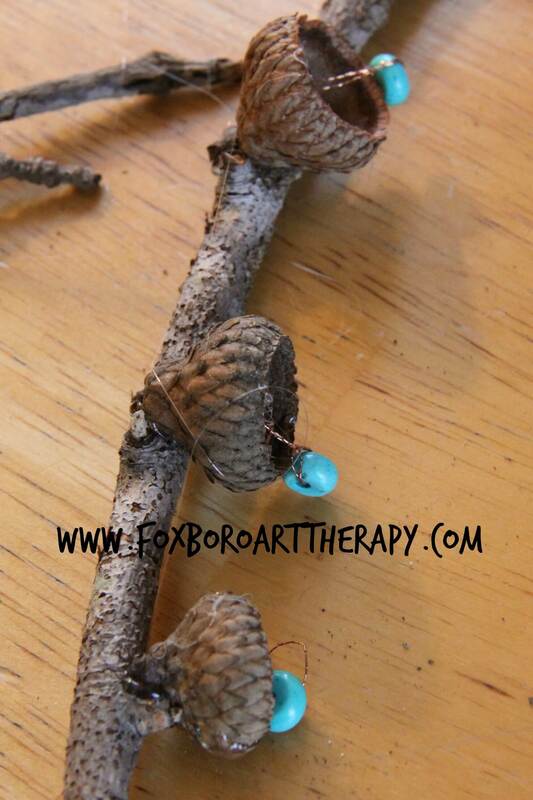 Take a short walk and pick up two natural materials that catch your eye. Now find a quiet space and create a short story or poem about the relationship, real or imaginary, between the two. 5. Create a Spirit Stick – See this tutorial. This is the creativity challenge #4. You can share about your experience with the community in many different ways – you can comment below, share a picture on the Facebook Creative Self-Care group, Tweet or Instagram your pic with #nomistakes. Will you share your experience? What other natural art projects have I forgotten? Did you find the project helped your mood? 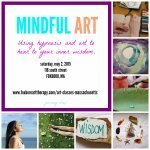 Do More Natural Art at the Mindful Art Workshop, May 2nd! Thank you for the great ideas! I live very close to nature and our cottage is completely surrounded by forest and there is also a big lake. 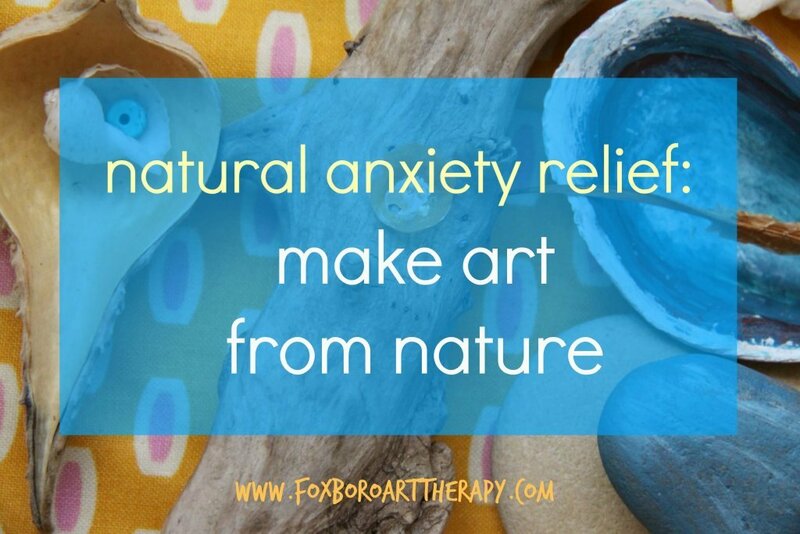 I will certainly use these ideas also with my son as he suffers from anxiety, too. It’s so lovely to have you here, welcome to Mindful Art Studio! Wow, living in a cottage surrounded by forest and near a big lake sounds amazing. I am envisioning outdoor sculptures and installation pieces! I’m thinking some take offs from Tibetan prayer flags, painted tree trunks, hanging natural object sculptures suspended with hemp, spirit sticks, and painted stones to create a labyrinth. The possibilities are endless! 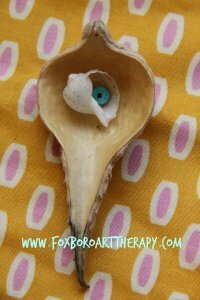 I’m thinking you may be inspired by some of the ideas on my Pinterest board, Art, Nature and Spirituality. 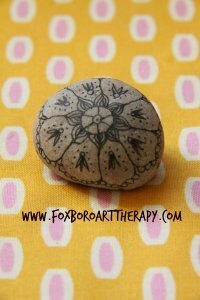 You may also enjoy being a part of our private FB group, Creative Self-Care. And if you haven’t already, be sure to sign up for my mailing list so you don’t miss out on more inspiration. What a pleasure to have you here. Please let me know if I can provide any more direction with the art!